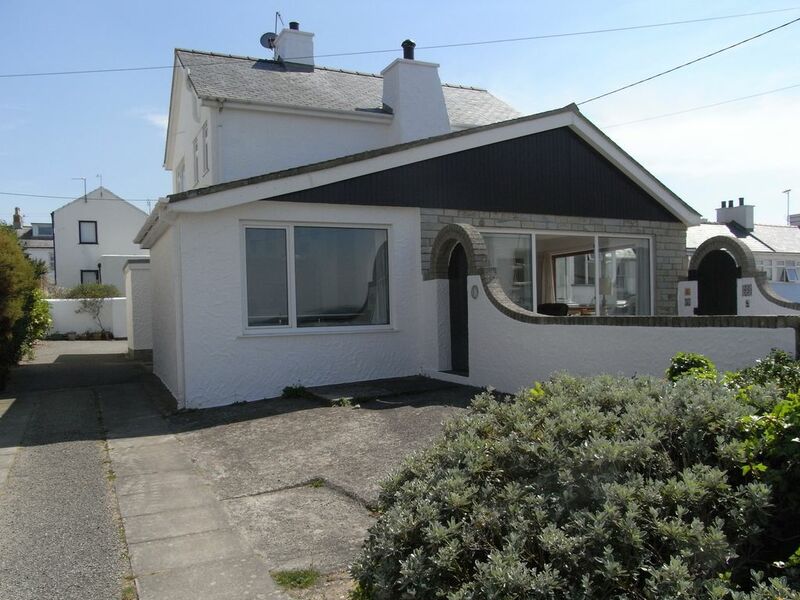 The property is probably one of the best located in Rhosneigr being only a few yards from the main beach accessed by a private sandy track and 2 minutes’ walk from the shops and restaurants in Rhosneigr village. There are four bedrooms, 2 double, 1 twin and one with a single and a camp bed, one bathroom and one shower room with washbasin and WC. The living room has fantastic sea views and sliding doors leading onto the enclosed patio overlooking the sea. There is a large kitchen/dining/lounge. The kitchen has dishwasher, microwave, electric oven/hob, fridge/freezer, etc.. The lounge has a wood burning stove, TV with free sat and DVD player. There is unlimited free wifi internet. The house is set down a private drive, with parking around the property for several cars and boats. The close proximity to the beach and village make this property ideal for families with children. A maximum of two well behaved dogs are allowed. The house is available on weekly lets. All bed linen is provided, but not towels. Bathroom 2 is located by rear entrance so is ideal for activities/coming off the beach. 1 dog allowed by prior arrangement. We had a great time staying here. The property is in a really convenient position, a very short walk to the beach. Brilliant for my elderly mother. Everything was clean and tidy and we will hopefully be returning in the future. Great position , very well stocked house everything that you could need , comfortable beds , a strong powerful shower , a very helpful , considerate and professional owner . Only reason we've not given 5stars , is that the property would benefit from a general updating throughout , but that's reflected in the price . We have stayed at this lovely bright and spacious property three times in the last three years and each time we have come home feeling relaxed and refreshed. My only criticism is that the photos on the website look quite dull and don't do justice to how light and bright the property is. The house is in a superb location with sea views and we've been lucky to see some amazing sunsets. The long stretch of beach is only a few yards away and such a fabulous place to exercise our dogs who love it there. At certain times of the day you can watch helicopters and other aircraft from RAF Valley flying overhead which all adds to the atmosphere. A few hundred yards in the opposite direction and you are in the friendly village of Rhosneigr with its lovely cafes, restaurants and shops. I think there is something for everyone there and the village has a great feel to it. Our last stay at Sibrwd-y-don was in May this year and on arrival the house was spotlessly clean and welcoming, which is how we've found it to be on each occasion. The beds are really comfortable ensuring a good night's sleep, plus it's also very peaceful and quiet. It's always a pleasure to deal with Colin Smith, the owner, whose quick response to e-mails/queries makes the booking process hassle-free. Well worth a visit are South Stack Lighthouse and RSPB Reserve at Holyhead. Stunning views, free parking and excellent cafe. Newborough Forest, where red squirrels were reintroduced, is a magical place and great for collecting pine cones. We also enjoyed our trip to Aberrfraw, and Beaumaris is also a delightful place. I can highly recommend eating at the Oyster Catcher (dogs welcome outside), and also the White Eagle at Rhoscolyn where dogs are welcome inside. There are some lovely eateries in the village too. Sainsbury's and Asda will deliver your weekly shop to the house and we've used this facility on two occasions. There could be others that I'm not aware of. Plenty of space and kitchen was well equipped. Beds were clean and very comfortable. This is a lovely house with lots of space and is very comfortable but it is in need of some care and attention. The downstairs shower room had a lot of black mould around the shower and the toilet leaked all week. We did not like using it. A plumber was sent but we were expected to be there to let him in. He was unable to fix the problem during our stay. It was also disappointing that the wifi did not work all week A new router was sent but we were out when it was delivered although no one told us it was arriving. I assume we would have been expected to install it ourselves. Guests should not be expected to stay in for these things. There was wallpaper peeling off ceilings and curtains hanging off rails. Contact with the owner was difficult without wifi and Rhosneigner clearly has a poor mobile signal. Rhosneigr is a beautiful village and we very much enjoyed our stay, particularly walking on the beach. The 'Oyster Catcher' just outside the village is lovely for coffee, a drink or a meal. Since we had two small children with us we did not eat out anywhere else. There are two small, local shops which stock essentials but you need to go to a supermarket in Holyhead, for example, for more variety. Thank you for your review and raising the points therein. Unfotunately we could not get the wifi rectified in time for the start of your stay due to delays with Openreach. We did however inform you in advance that the wifi was not working and have promised to pass on any refund from the broadband provider to yourself. We take on board the point about the mould and have asked the cleaners to be diligent with regard to this in the future. We're sorry about the small leak in the toilet but we managed to get a plumber there within 24 hours of the problem being reported, no mean feat given that it was Xmas week! Unfortunately the work required was not something that he could do there and then but has subsequently been carried out. Rhosneigr village is situated on the beautiful west coast of Anglesey, North Wales. It has a thriving community and a rich history. Award winning sandy beaches with rock pools and safe bathing, a large lake rich in bird life and fish, unspoilt countryside stretching for miles and magnificent views of the Snowdonia Mountains and Lleyn Peninsular make Rhosneigr an idyllic location. Rhosneigr's heyday was in the Edwardian era when it was a highly fashionable holiday destination. Today, it is still a popular holiday resort that has retained it's charm and outstanding natural beauty. It offers a host of leisure activities including fishing (sea and course), tennis, bowls, sailing, diving, surfing, horse riding and is especially well known for windsurfing and golf. There are several pubs, clubs and restaurants as well as the usual shops and post office. The major towns of Holyhead and Llangefni and the City of Bangor are all within easy travelling distance. 25% non refundable deposit required on booking, balance due 30 days prior to stay.